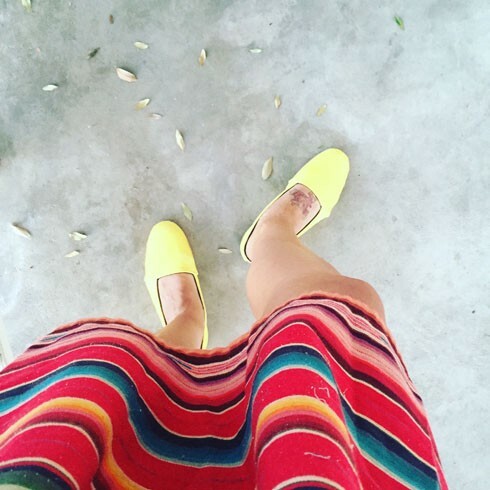 You are here: Home / Try Curious Blog / DIY / Red leather, yellow leather SHOES! Red leather, yellow leather SHOES! 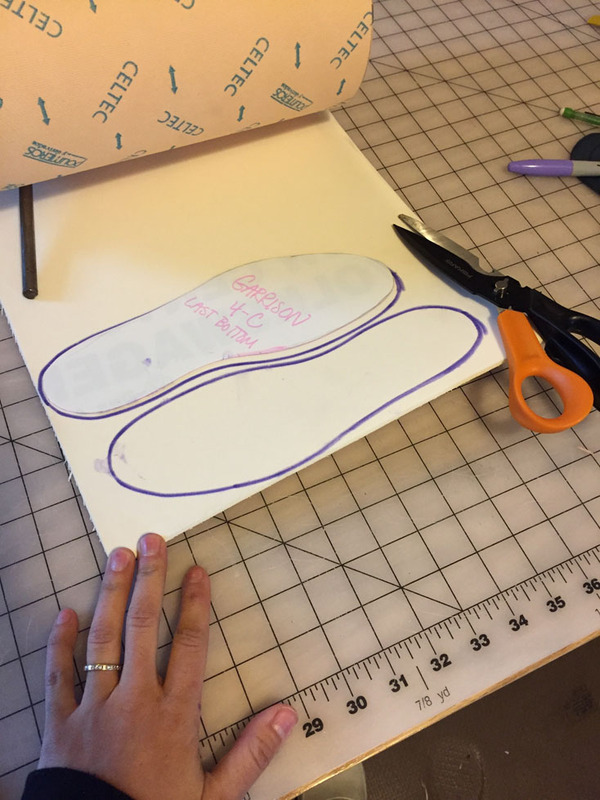 After Cashmerette posted a really great overview of her sandal making class on her blog, I felt inspired to join in the fun. 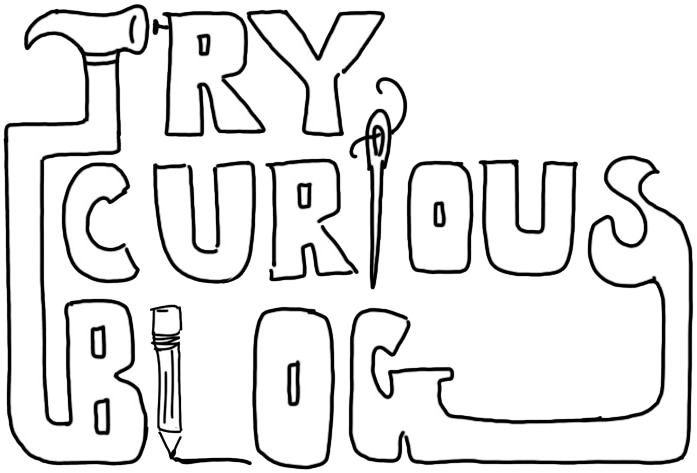 I think it’s really exciting and motivating to see more and more people dipping their toes into the furthest corners of the DIY-osphere, and it’s also nice for me to document my own stuff so that I can see my personal growth in the arena. 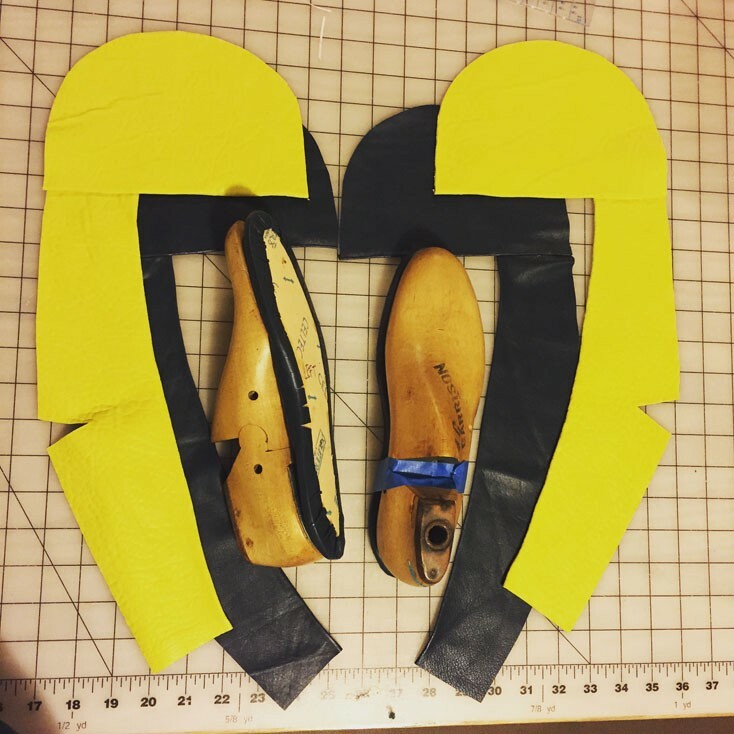 I have posted before about general shoe making here, but for this post I am going to do a photo heavy step-by-step show-and tell so that you can see each individual part of my process. This is not a shoe-making tutorial- it’s not meant to guide you through making your own shoes- but rather it’s meant to be a kind of visual synopsis so that you can see the steps involved chronologically and have a better understanding of what is involved in case it’s something you feel like learning more about yourself. 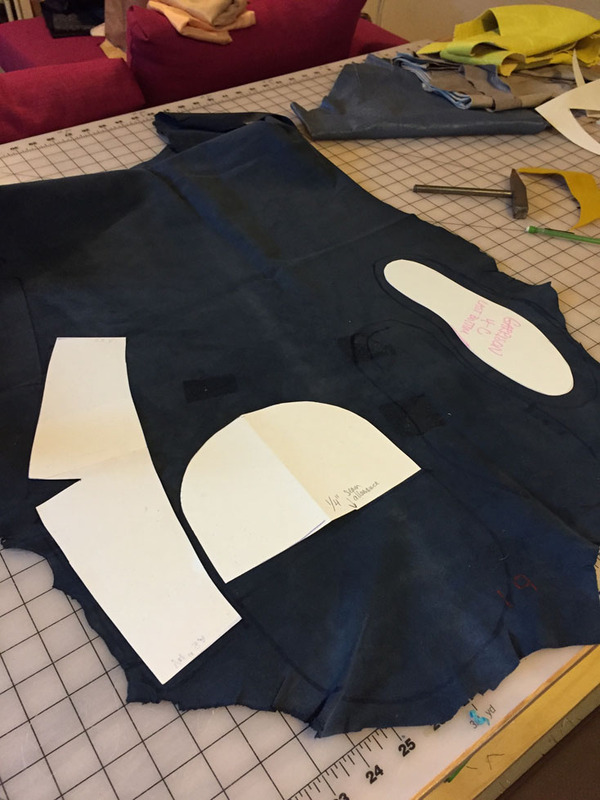 Sometimes certain projects seem daunting when I only see it in it’s finished form, but when you see the steps laid out separately it can seem a little more manageable. 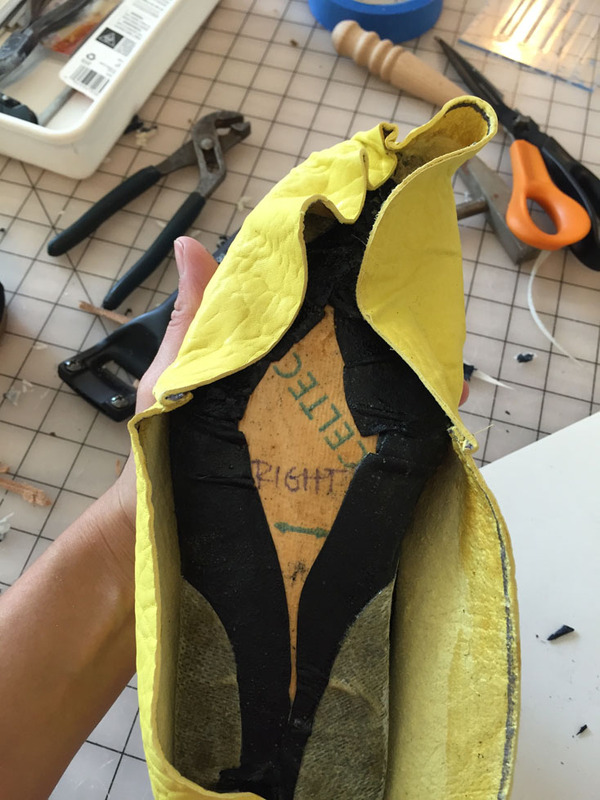 One important note here is that there are a LOT of different ways to make shoes, and for the most part, none of them are inherently right or wrong; I am still figuring out my own preferences for my process from the information that I have gathered from reading books and taking classes. Ideally I would like to learn how to make shoes the old school way by hand sewing the leather pieces together, using shoe tacks, and using way less toxic cement glue, but for now I am still trying to get more familiar with lasting and understanding how leather works before I move onto sewing them by hand. 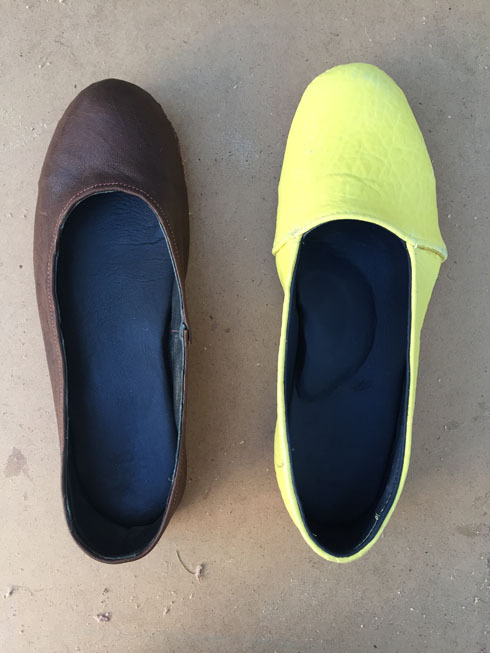 The last pair of shoes I made were a pair of brown leather ballet flats and they were the first pair that were both functional and a great fit for the shape and size of my foot. Once they were finished, I was simultaneously thrilled with how they turned out and itching to make another pair to fix all the things that I wanted to change about them. The construction method I had been working from tells you to leave the edge of your lining as-is while lasting the shoe (meaning not to turn the edge under) and have about 5mm peeking out past the upper. 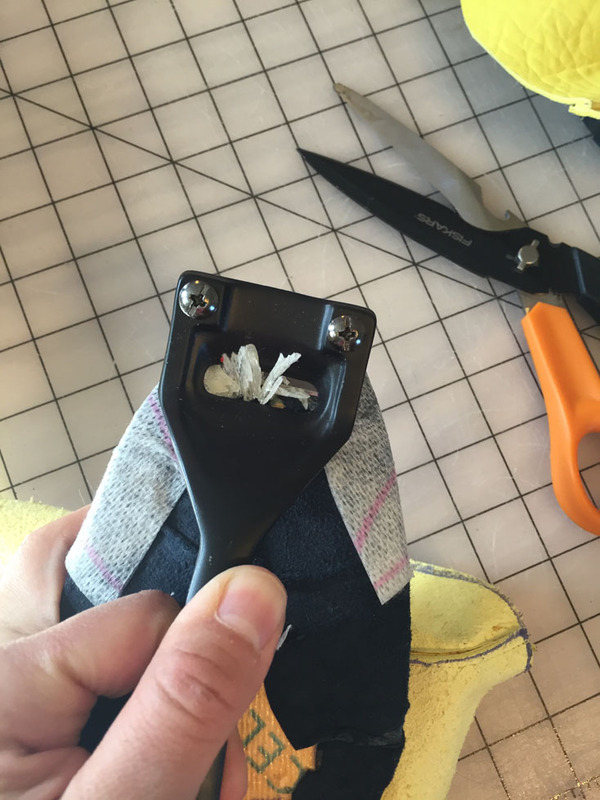 Once the shoe is complete and you’re ready to take the shoe off the last, you are supposed to use a sharp knife to trim the edge of the lining off of the shoe. This, in my experience, is a TERRIBLE idea. For one thing, your knife has to be super duper super sharp to slice the edges smoothly, but you have to cut carefully so that you don’t slice into the upper of your shoe. You also end up digging into your shoe last with your knife, carving out a huge and unsightly circle around the last. I consider myself to be fairly dexterous, but on each pair of shoes I used this method on, my results were disastrous. The upper leather is butchered with tiny slices dug into it from my knife, and the lining edge underneath isn’t cut smoothly at all- it peeks out in some places, is cut down to the inside of the shoe in others, and is generally raggedy looking. For the next pair I made, I wanted to fold down the edge of my lining and sew the upper and the lining together around the mouth of the shoe so that I wouldn’t have a raw edge that needed to be cut later. The other thing I needed to change about the shoe was my tight grip during the lasting process. Lasting means pulling and securing the lining and the upper around the shoe mold, aka last, and if you pull the leather too tight, you risk shortening the rise of your shoe. And finally, I wanted to finesse the look of my sole. In my leather working book I read about burnishing the edges of the leather so that it looks smooth and clean and it doesn’t have the rough fibers of the leather poking out anywhere, so I was excited to apply this technique to my next pair. Now that my latest pair of shoes are done, I can see exactly what worked and didn’t. Pretty much everything I wanted to fix from my last pair was successful: the rise is perfect on these and they fit on my feet without feeling like they are going to fall off. The lining edge is sewn under and looks clean and smooth next to the upper. The soles look great with their burnished edges. I put in some small arch supports so that the shoes wouldn’t be so flat. I added a small heel made of one layer of leather and one of rubber (I might add rubber to the sole of the rest of the shoe but I wanted to wear them first to see if they were necessary. The only thing that I messed up was forgetting to skiv the seams of the shoe. With my last pair, the leather was pretty thin and didn’t create much bulk at the seams at all, but this leather was much thicker, and forgetting to thin those edges was a total oversight on my part. 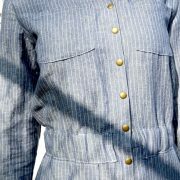 As a result, the seams are super bulky. I think the shoes still look great, but I wish I had paid better attention to that. 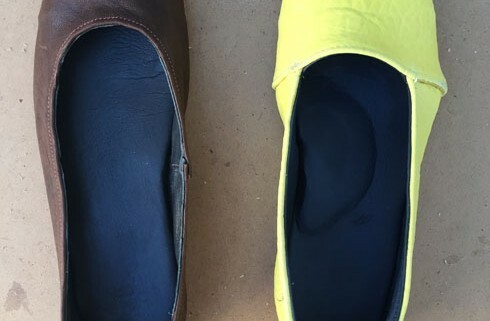 My only other issue, and this is a small one, is figuring out how to keep light-colored leather looking great while turning them into shoes. The process gets a bit messy, especially with the cement glue, and once they were all finished I kept finding tiny spots of dirt and gunk on the yellow leather. I could probably treat the leather before making the shoes so that dirt and grime will wipe off easily once they are complete. Now, onto the steps of construction (from here on out, captions will be placed below the accompanying photo)! I used some scrap felt material and small nails to play around with the design of the shoe before cutting out my leather. 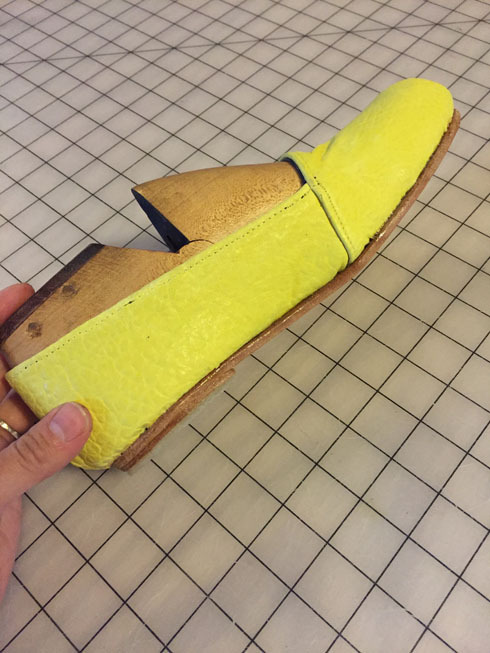 I have a few cool ideas for shoes with cut outs and interesting design features, but I want to get good at making a simple slip-on first. This style basically looks like a pair of TOM’s. 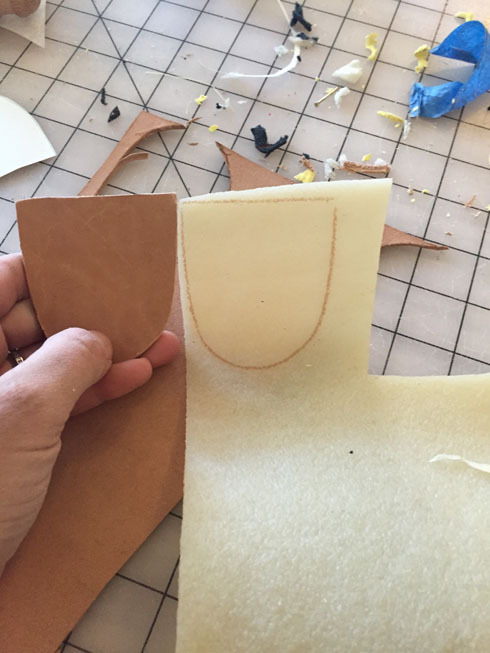 Once I figured out my pattern from the felt template, I cut out the pieces from my leather. 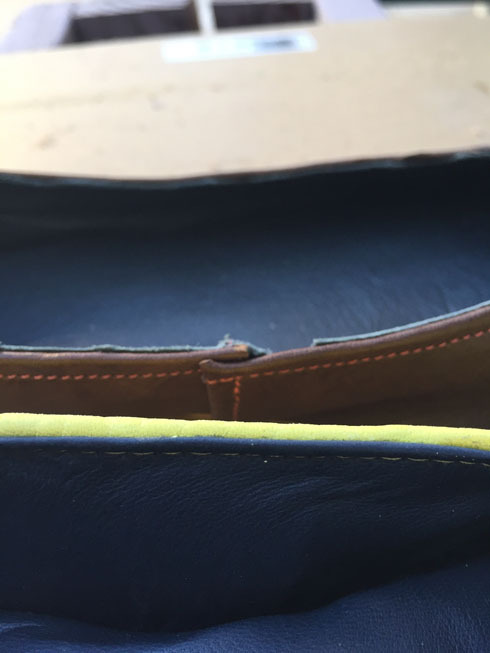 The yellow leather is for my upper (or the outer part of the shoe) and the dark blue is a lighter weight leather that I use for the lining and the inner soles. 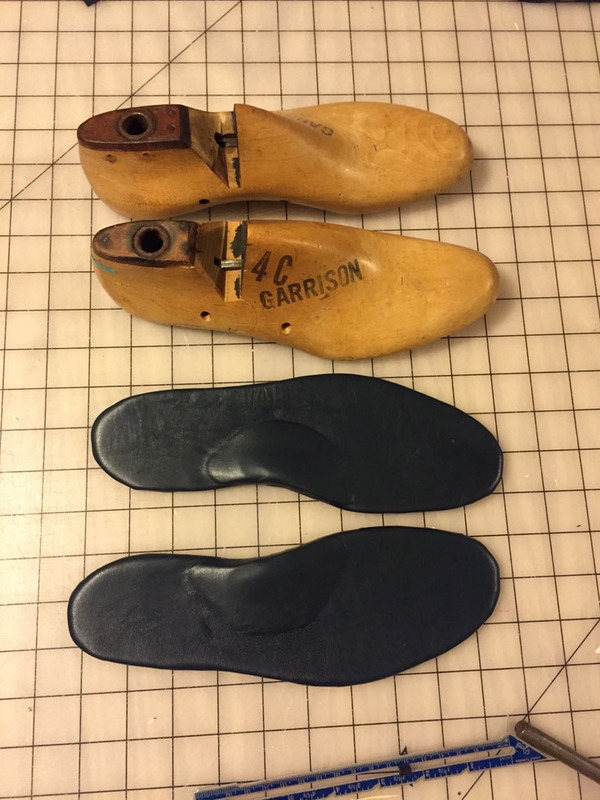 There are two pieces to the pattern aside from the insole: one U shaped for the toe area, and a longer piece which will make up the sides and back of the shoe. The pieces are sewn together on my sewing machine. 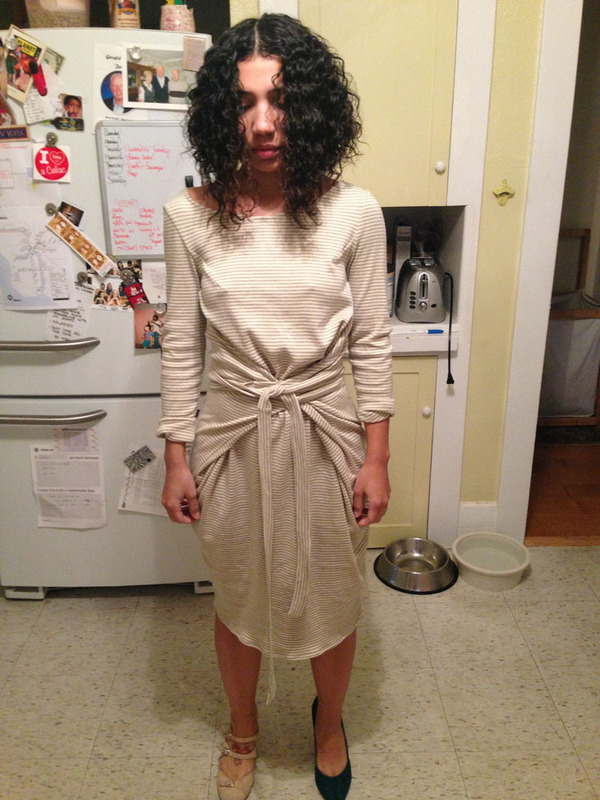 Before sewing the two pieces of the pattern together, I used cement glue to tack them into place. It is important to let this dry before using your sewing machine to sew the pieces together, otherwise your needle will get gunky with glue. 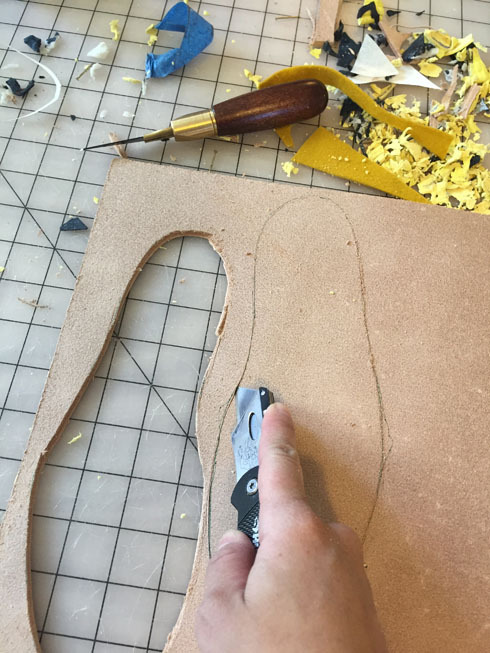 Cutting the inner sole shapes out of foamboard. 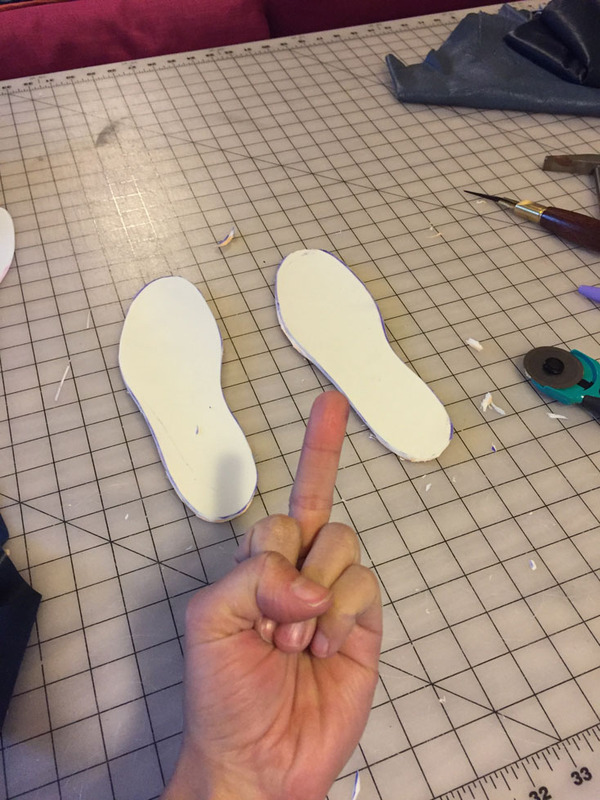 Totally forgot to turn over one inner sole pattern piece when cutting out of my foam board so I had two left feet! I bought some gel arch inserts for my insoles to give me a little support in the shoe and they worked out very well! I just glued them onto the foam board in the proper place before I attached my lining leather . Lining leather is cut out in the shape of the insoles with extra room around all edges to fold over to the underside. 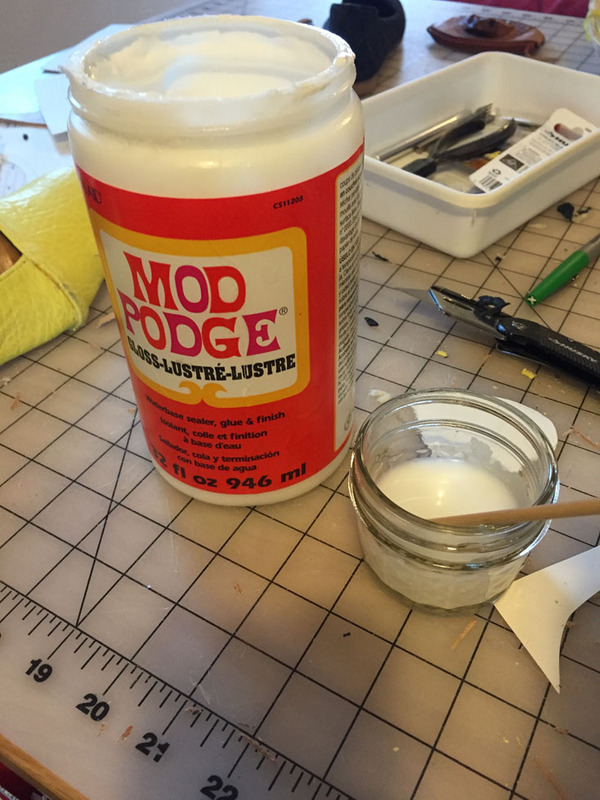 Both surfaces must be coated in a thin layer of glue, left to dry til it’s barely tacky, then pressed together so that the cement can properly adhere. The inner curve of the insole leather gets little snips cut into it so that it can be folded smoothly around the edges. 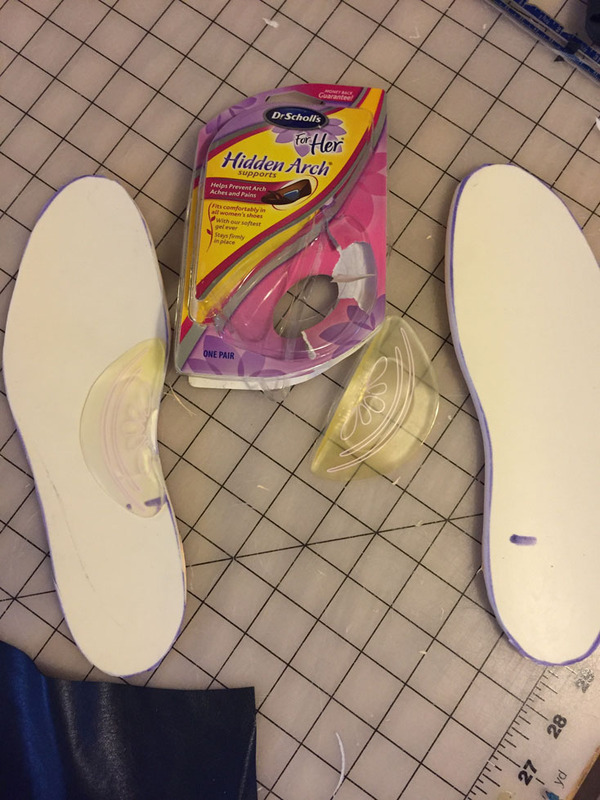 Insoles are temporarily attached to the bottom of the lasts with either tape or nails- I don’t have a preference, because sometimes tiny nail holes are left in visible places on the top of the insole, and other times the tape is hard to get off once the upper and lining has been lasted. The upper leather and lining leather get a bit of glue around all the edges where it will be folded over and later stitched- here is where I should have remembered to skiv the leather to thin it out and make it less bulky. I think I forgot to take a picture for the next couple of steps in this process so I will just explain it. After the edges of the upper and lining have been glued under, I put the lining and the upper leather pattern pieces together so that wrong sides are facing and I sew them together around the mouth of the shoe. The bottom parts of the leather are left as-is. 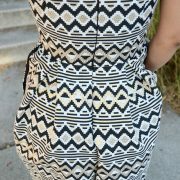 I also separately sew up the back seams (they are not connected here). You see the little V-shape cut out in the photo above? 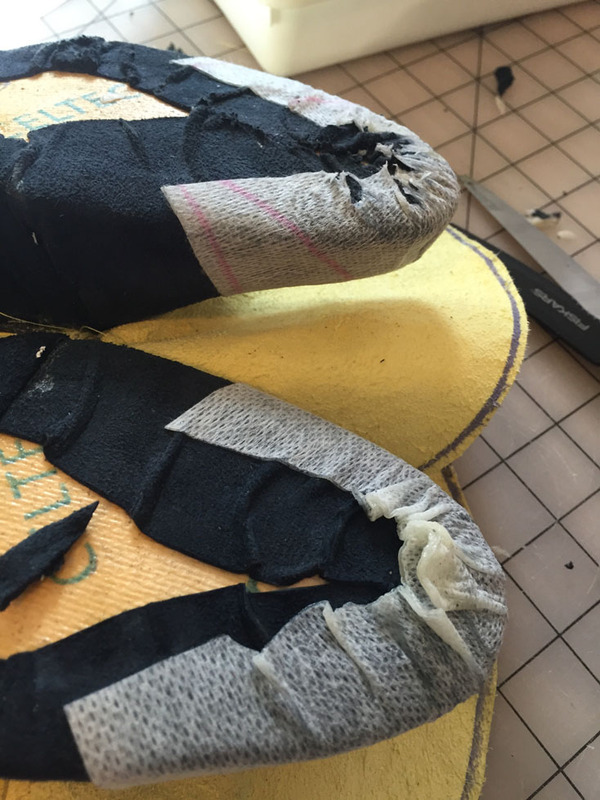 That gets sewn together with about 5 mm seam allowance and creates a little curve in the shoe where the heel of your foot rests. Next I cut out pattern pieces for my toe boxes and counters. A toe box is a piece of firm material that covers your toe area and keeps your toes from poking through the upper fabric (in case you have wildly sharp toenails or something??) and also keeps your toe shape from distorting the upper material. A counter firms up the back of the shoe so that it retains it’s shape throughout wear. Check out a pair of shoes that you have, flats or heels- you might not have noticed it before but if you feel around the shoe, you will find a firmer material in the back area and most likely the toe area, too. I seem to be missing another important photo here! UGH! I know that in support of the maker blogger community I’m not supposed to be ablogogizing anymore, so ummm. I guess, deal with it? HA! Anyways, here is what is missing: I placed my upper and lining leather that I had sewn together in a previous step onto the last. Then I pulled JUST the lining leather around the last and onto the bottom of the shoe (the upper leather is connected to the lining leather only at the top, remember? 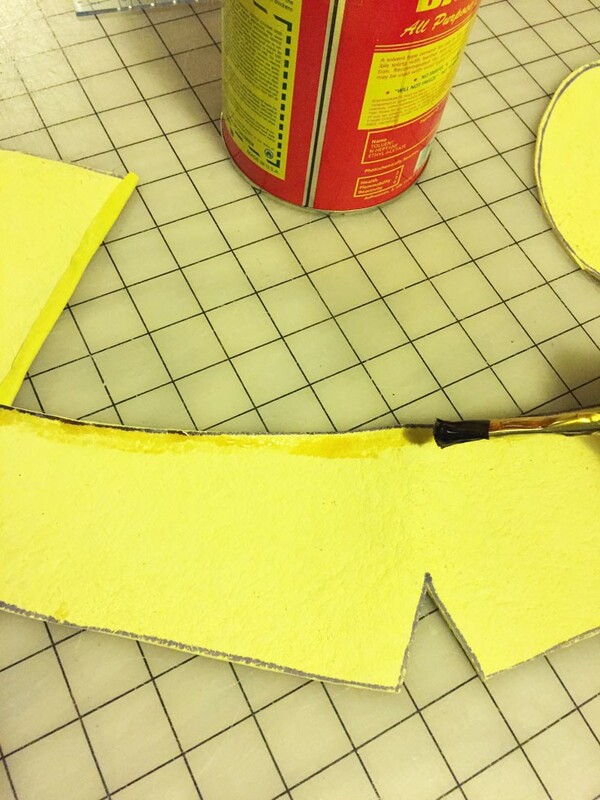 ), and then I glued the lining in place by connecting it to the bottom of the insole that I had temporarily attached to the last. 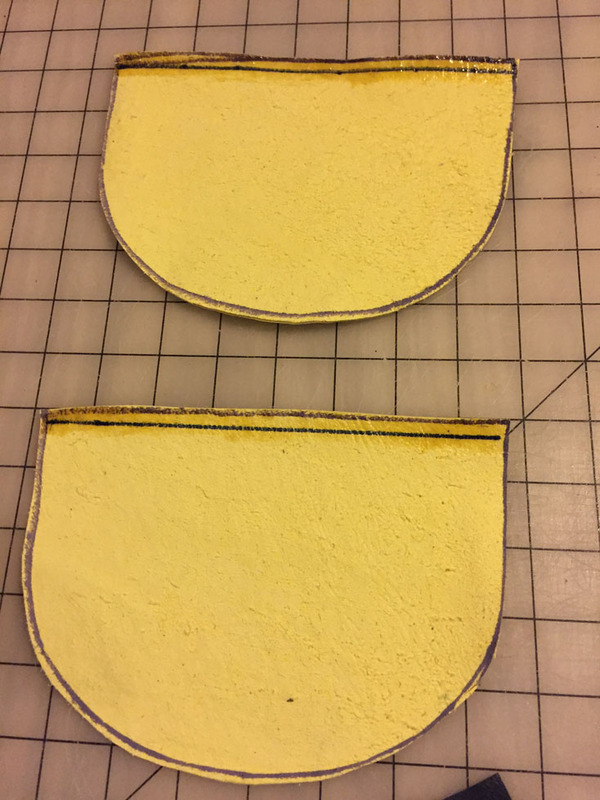 I will be doing this step again with the upper leather and I have pics of it later on in this post, so just imagine that happening with the lining leather first. After the lining has been lasted, the toe area and back area where the counter will go is covered with a thin layer of glue. Once my lining leather is in place, it’s time to adhere the toe box and counter. These are made of a heat activated material with a sticky glue on one side (this part goes onto the lining) that I warm up in the oven just to get pliable. Then I use my heat gun to warm it up even more and finish applying it. When this material cools it hardens, so you have to work fast while also taking care not to burn your fingers on the hot material. 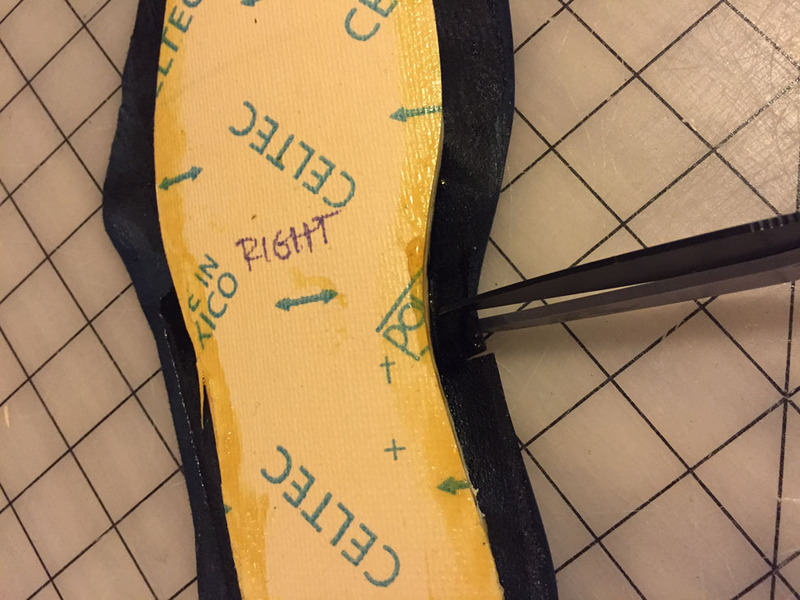 You want to cover the toe area with the toe box and and bring all the extra material to the underside while making sure it doesn’t have creases or ridges on the top of the shoe. This part is tricky, but I am getting better at it, and you can always re-heat the material to make it soft and pliable again if you mess it up. Here is what the last looks like once the toe box and counter have been applied. You can see my lining leather folded around the last and glued onto the underside of the insole/foamboard, and the upper leather is unattached except at the mouth of the shoe. Here is one of the most important parts of shoe making, and it also happens to be the most tiresome and time-sucking! It is called skivving (I mentioned it earlier), and it essentially involves using a sharp blade to trim and thin out the bulky area of your shoes. In the above photo I am using a special tool which helps keep your fingers safe while skiving, which is nice because it’s easy to cut yourself in this step- you want a very sharp blade but you also need to use a good amount of strength to shave off the most material in thick areas. I have found that using a sanding attachment on my Dremel helps with a lot with reducing bulk, but you have to go SO slowly and carefully or you might sand off some of the leather on the sides of the shoe (which I have done. Many, many times). Here is a photo of one shoe that has the toe box skivved and one that doesn’t. 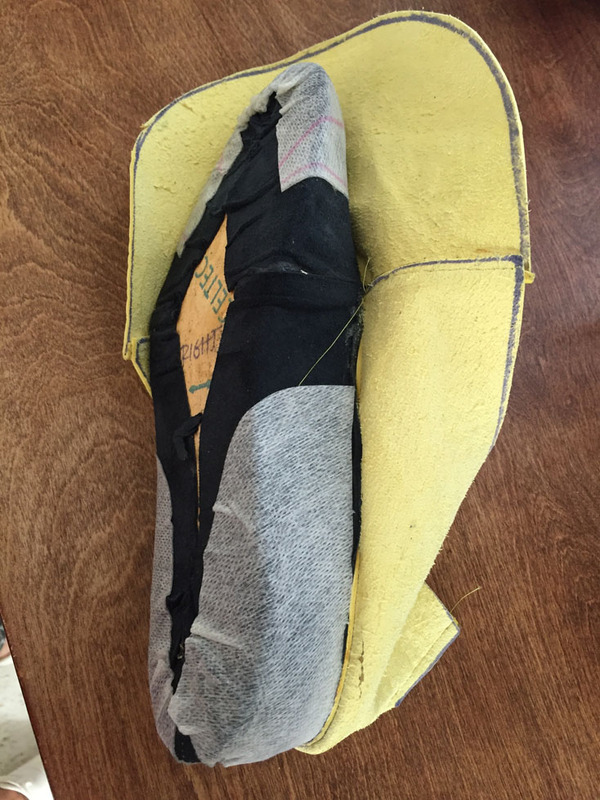 Some of the folds of the lining leather have also been trimmed to minimize bulk. 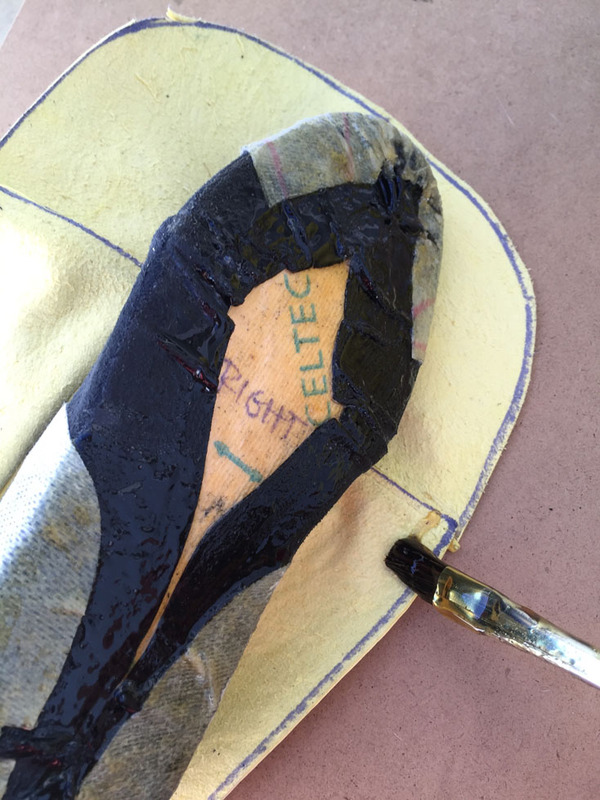 Once the toe box and counters have been skived down, it’s time to last the outer/upper of the shoe. Glue gets applied liberally on the inside of the outer leather and on the bottom of the shoe- this type of glue only adheres to itself, so it must be applies to everything that needs to stick together. 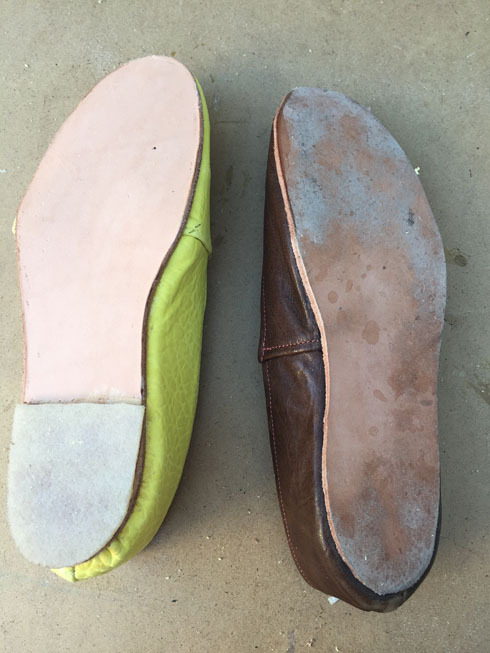 Once the glue on both areas is slightly dry, you can start folding your leather onto the bottom of the shoe. The goal is to pull the leather around tightly and uniformly so that it doesn’t crease and gather in folds on the visible parts of the shoe, but you also don’t want to pull so much that the shoe loses it’s shape on the top of the last (this is how my previous pair of flats are so low around the foot- I pulled the leather too tightly). The thicker your leather is, the more difficult it is to get the toe area completely smooth- I didn’t perfect it on this pair of shoes but it’s not very visible unless you are looking at the shoes from the bottom. 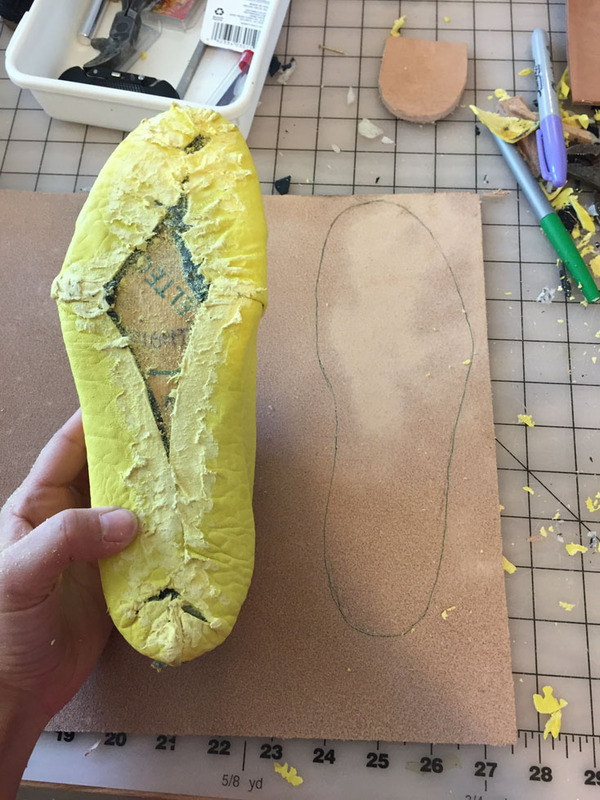 Here is what the shoe looks like once its been fully lasted with glue, and now it’s time to skiv the crap out of it and reduce all that bulk. I drew a faint line around the edge above the line of where the sole will go to show me where I couldn’t skiv past. The shoe bottom is now skived, and it also needs to be sanded so that the soling leather will adhere to it properly. 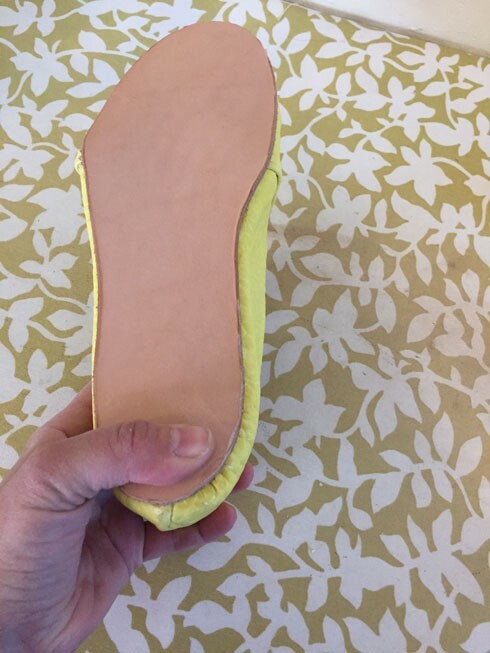 I have traced an outline of my finished shoe onto the leather I am using for the soles (it’s 12 oz and much thicker than the lining and upper leather). I keep forgetting to cut the soles out slightly larger than the actual shoe, particularly around the toe area! DOH! As I mentioned, I recently read about a technique called “burnishing” that finishes the edges of your leather, and I used it on this pair of shoes and am thrilled with the results! To burnish leather, you first use a tool called a beveler to smooth the rough edges, and it worked fine, but I think my tool was slightly smaller than what I needed, so I ended up mostly using my Dremel to sand and even out the edge of the soling leather. Next I used a simple solution of mod podge and water (my book recommends something called “paper gum” which I could not find for purchase anywhere on google and which ultimately just seemed like elmer’s craft glue diluted with water) which I applied to the outside edges of the sole, and then I used a piece of canvas fabric to vigorously rub the edge of the sole with the glue solution on it. According to my book, the friction of the rubbing creates heat which binds the fibers of the leather together and then the watery glue holds it in, giving the edge a clean look. Above, you can see the burnished leather on the left and the non-burnished on the right- it makes a big difference! 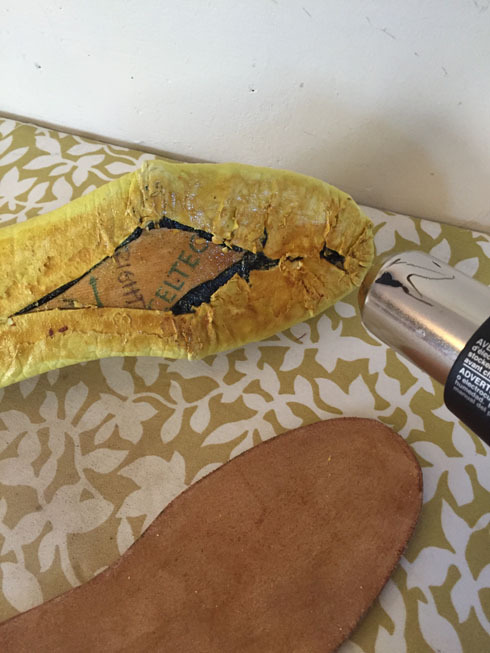 The bottom of the shoe and the inside bottom of the soling leather get coated with glue which is left to dry for at least a half hour and up to a full day, making the bond even stronger. 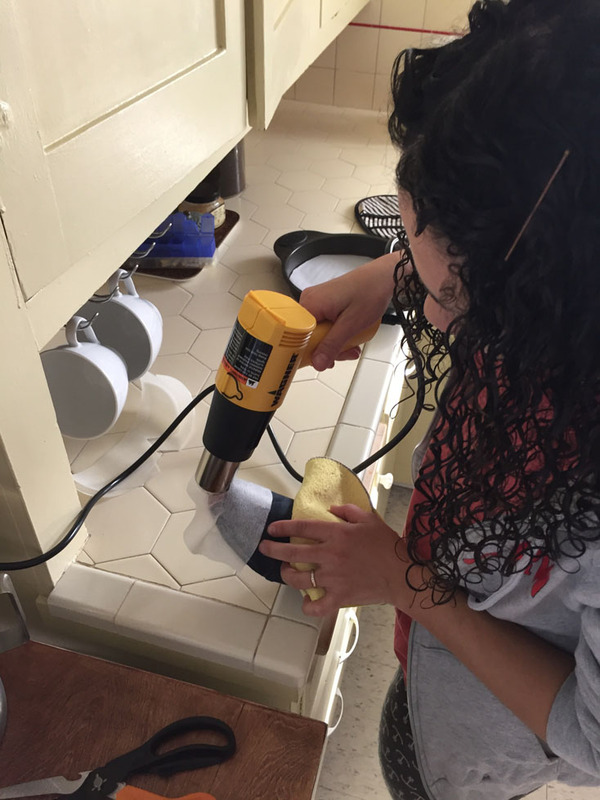 To activate the glue once it has completely dried, you can heat it up with your heat gun, which is helpful because it allows you to work area by area, making sure that your sole is attaching to the shoe bottom in just the right places. I press the sole onto the bottom of the shoe for several seconds with as much strength as I can muster, but because I don’t have a fancy shoe press like the ones in factories, I came up with another idea. Not fancy, but it gets the job done! 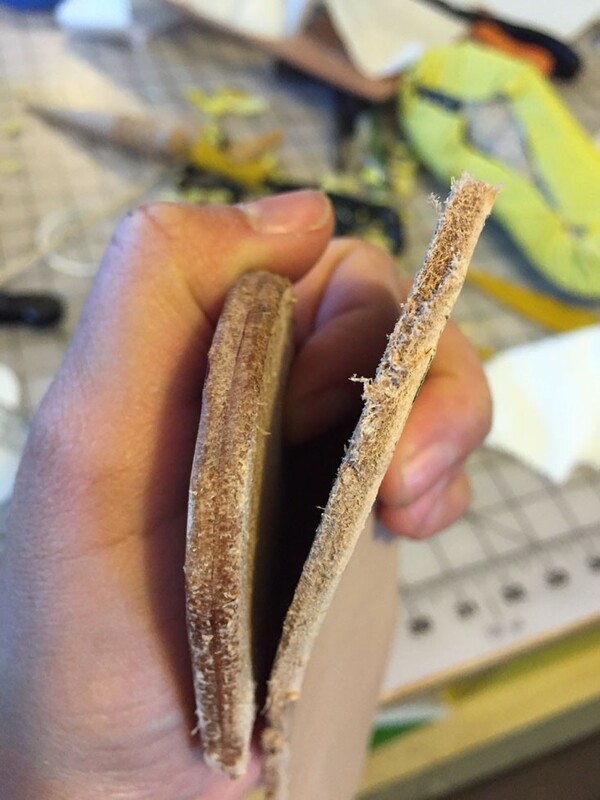 I used some clips from my woodshop to keep a tight grip on the sole and shoe as the glue dried, and I used extra bits of rubber to keep the clips from leaving marks on the leather. 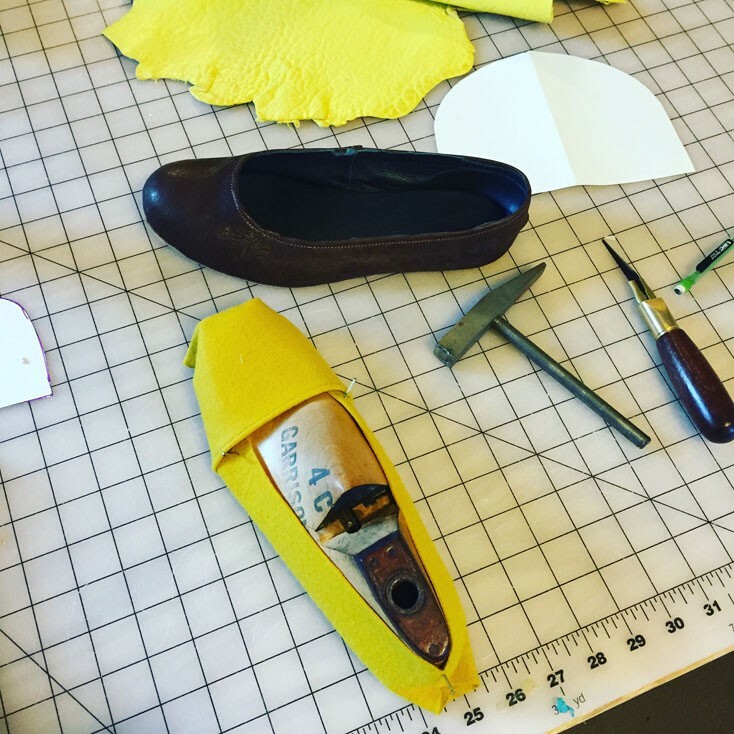 I wanted to see what it was like to make flats with a small heel after I saw a blog post on pinterest of a shoemaker making a stacked heel out of leather (SO COOL! ), so I cut out a piece of soling leather and an accompanying piece of sole rubber to glue together and stick onto the bottom of my shoe. Once everything has been glued together and is completely dry, you can carefully pull your last out of the shoe and try it on! I’m not gonna lie, I always do this step way before everything is dry because the anticipation of trying the shoe on after all your hard work is just too great! You can’t really tell from these photos but the sides are much higher (and therefore better fitting) on the yellow shoes than the brown ones. 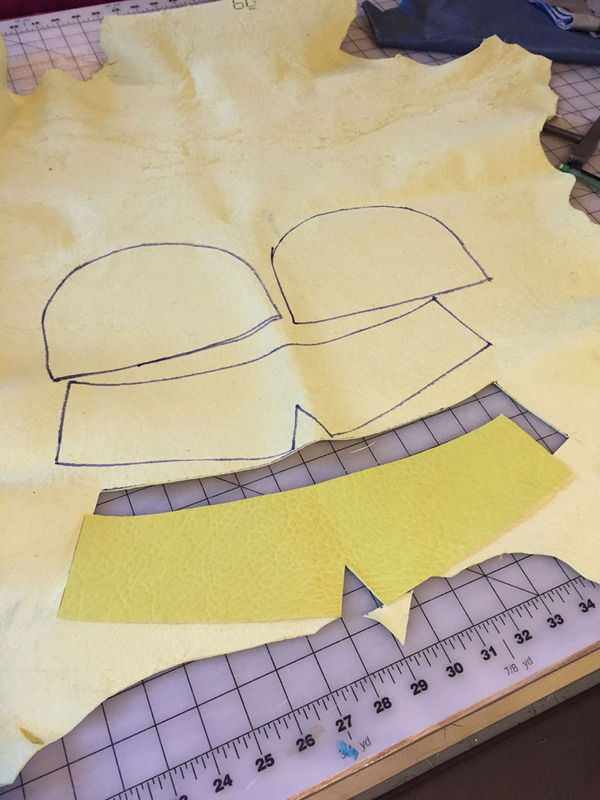 You can see how sloppy the edges of the mouth look on the brown ones look compared to the yellow ones, and you can also see how bulky the seams on the yellow ones look. They are not uncomfortable at all, they just don’t look as streamlined as the seams on the brown ones- again, this is because I totally forgot to skiv the seams of the leather before I attached the pieces together at the seams. The actual sole of the yellow shoe looks great, but the toe area is a little bulky and not very smooth where I pulled it around the last. 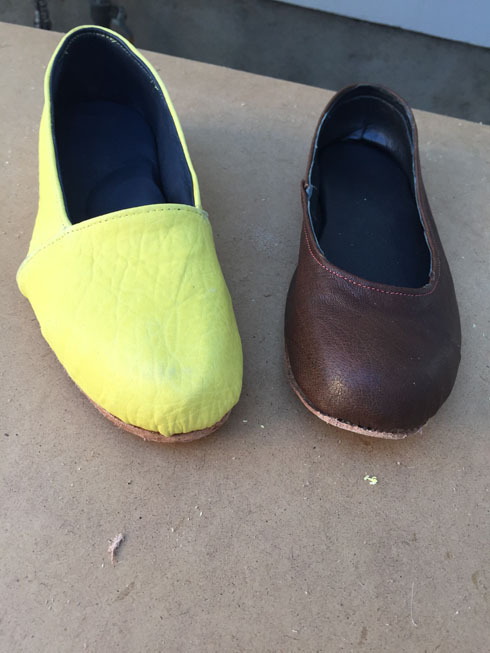 You can see the detail of how much better the lining leather looks on the yellow (bottom) shoe when I folded and sewed the lining and outer leather together instead of leaving the lining leather free and cutting around it with a knife as I was instructed to do on the brown pair. I’m not sold on the soling rubber on the heel as of right now. I used it to protect the soling leather from getting so scuffed up, but the rubber feels kind of sticky on the ground and sometimes makes me trip a bit- not so much that I fall or anything, but something about it doesn’t feel quite right. I might see if I can pull the rubber pieces off cause I know they will feel fine without them. I have worn my new leather shoes several times since I finished them and I absolutely adore them- the color is amazing, they are comfortable and I like having a simple design style like a TOM’s shoe without having to actually wear TOM’s. 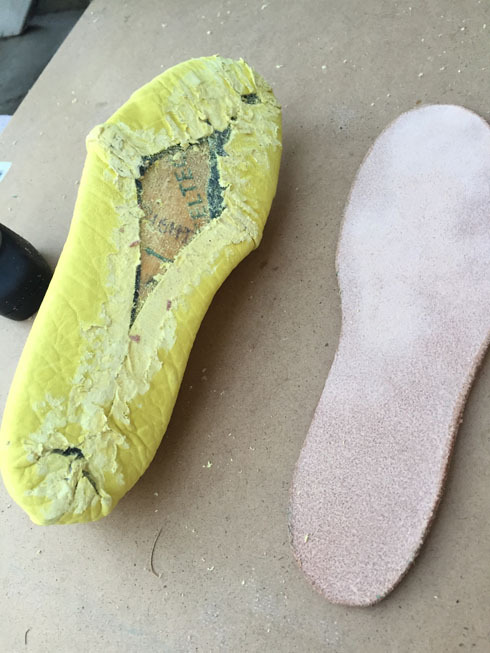 As you can see, there are a lot of steps involves in making shoes, but they don’t actually take that long- you can definitely start and finish a pair in a day with the exception of the glue-drying time. 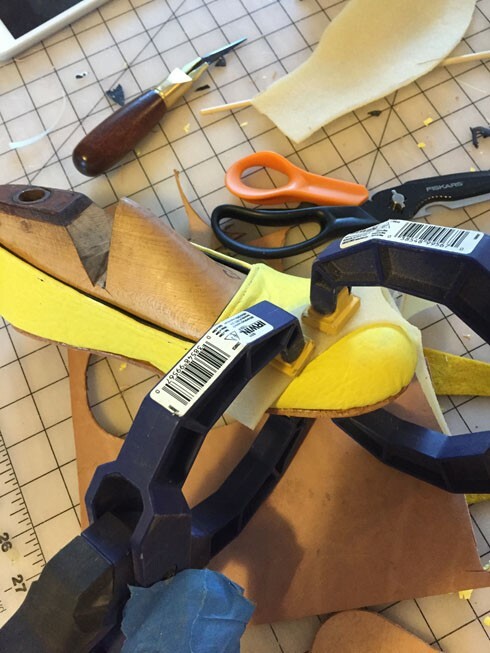 The trickiest part of shoe making is gathering all the various tools and materials that you will need, and for shoes like the kind I make, finding the last is the hardest part of the battle. You need a different last for each size of shoe you make and for each style, in addition to whether or not you want a flat or a heel, and if you want a heel, you need a different last for each heel height. Because different companies have different sizing in their lasts (in the same way that trying an 8.5 size shoe in one brand might feel totally different in another brand), my best method of finding a good last is going by measurement in inches from toe to heel. 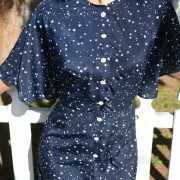 I have had the most success finding vintage lasts on eBay, but there are specific companies that sell new lasts online, and etsy also has shops that sell plastic and wood lasts. I don’t have a preference between plastic and wood myself- I have used both and they yielded great results, although I suppose that wood lasts are more aesthetically pleasing. This is the book that got me started on this journey a couple of years ago! It is an excellent book with great illustrations, articulate instructions, and info on making your own lasts and shoes out of found materials. It is super informative and all the information I have gathered from classes and courses in the past couple of years has had similar methods to what Loomis writes about in her book. I CAN MAKE SHOES is an online source I have relied on, and they also offer classes in-person in certain areas (I think they are located in the UK). They have some great materials for purchase in their shop and their shoe making kits are a great starting point for people who are interested in dipping their toes in the shoe-making waters without having to fully commit to buying all the supplies and tools necessary. Prescott & McKay is another good source for taking classes in shoe-making, and although they are based in the UK, they come to the states and offer satellite sources several times a year. I took their one-day shoe making course, and although I thought it was fun and helpful, I think that their 2+ day seminars are probably better. One day just doesn’t seem to be enough time to learn all the complicated bits and pieces of shoe making from scratch while also paying attention to design. I think this course would have been amazing if they had given us less freedom in designing the shoe and instead focused more on functionality- I would much rather have had less choice in how my resulting shoe looked as long as it ended up being wearable, which it wasn’t, because we didn’t have enough time to learn about strap placement and buckles, etc. Shoedo is an online store that sells various shoe components that are normally difficult to find if you are not buying wholesale, and I am so excited to have stumbled across them. I bought my foam board, several pairs of heels and some lasts from this site, in addition to other bits and pieces that I needed to stock up on. This of course is just a tiny little snippet of all the resources available to amateur shoemakers- etsy, craigslist and eBay have lots of more options on where to buy the components you need, and there are a surprising number of blogs out there by bespoke shoe makers who write about their process and share tutorials on how to do what they do. Although I have learned a lot in the past couple of years, I am excited to continue my journey of learning even more. 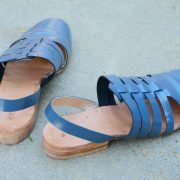 As I wrote at the beginning of this post, I am super excited to learn how to handsew leather shoes as opposed to just gluing the pieces together, and I am also looking forward to taking a leather sandal making class this Spring that is coming to Los Angeles. The method they teach doesn’t involve using a last and is instead based on the measurements of your individual foot. I can’t wait to see how that works! Hopefully it will be successful enough that I can share everything about it here on the blog, so stay tuned! http://jasikanicole.com/wordpress/wp-content/uploads/2016/02/yellowshoes_blog33.jpg 653 490 Jasika Nicole http://jasikanicole.com/wordpress/wp-content/uploads/2013/08/logo_green-300x78.jpg Jasika Nicole2016-02-20 14:08:142016-04-12 18:17:22Red leather, yellow leather SHOES! Amazing, thanks for sharing!! I might give it ago if I can get my hands on a last! Your finished shoes look really nice! 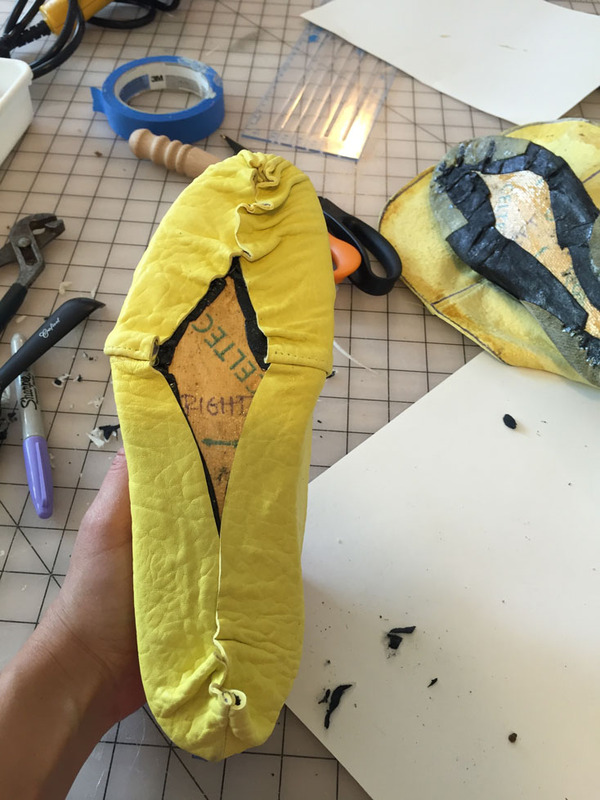 I have always wanted to try making shoes–that, and bra-making. But it’s daunting to have to research, hunt down, and acquire so many new tools and materials, plus I don’t have a lot of storage space for my crafts to begin with. But your explanation of your approach makes it seem totally doable, so thank you for sharing! Hopefully one day I’ll have a dedicated space for my crafts and sewing! Also, I’ve used “gum tragacanth” at my last job for burnishing leather edges, (I’m sure you could find it through Tandy Leather), but your Elmer’s solution seems to have done the trick. 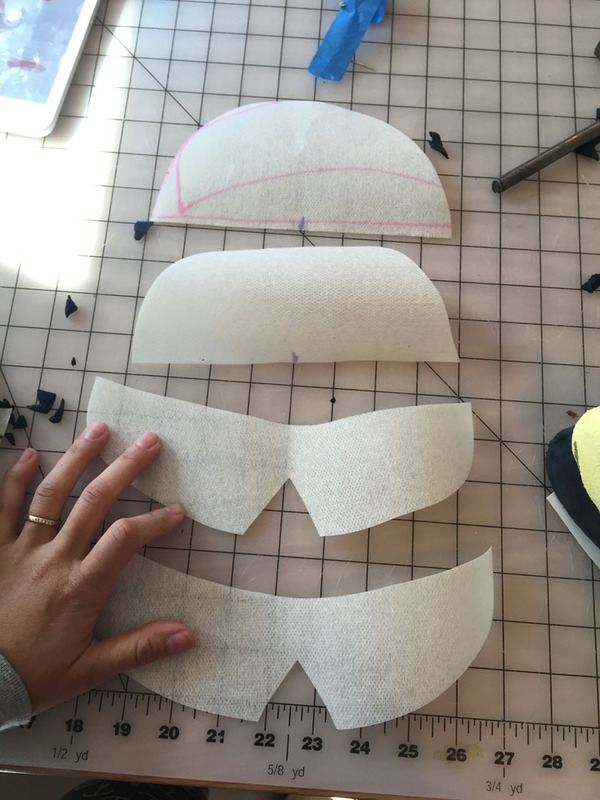 Absolutely fascinating post, it must be so satisfying to see the shoes coming together! I’m definitely intrigued by the book that tells you how to make your own lasts as this sounds like the most crucial part to me (I really struggle to fit into standard shoe sizes), but if I got a last that was the right size this is definitely something I would want to try! 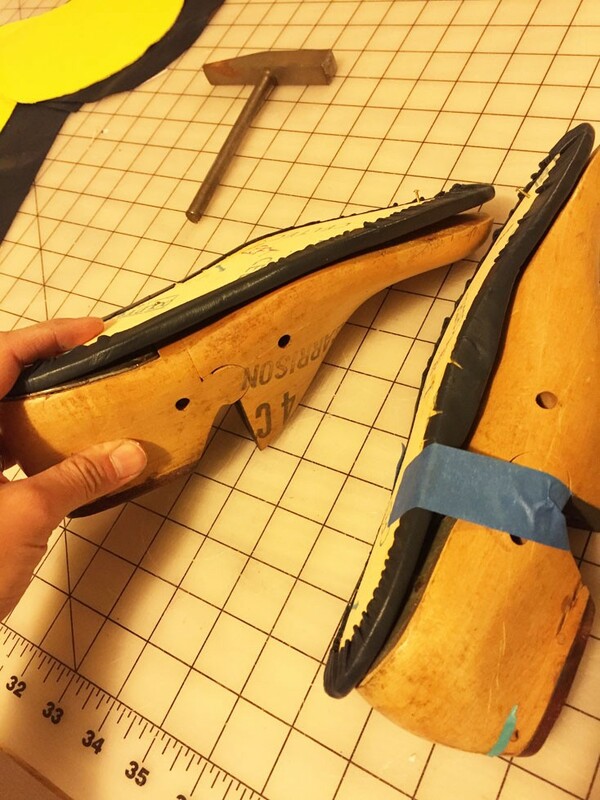 The last making she describes in her book is pretty straight forward and easy- essentially you use an old shoe that fits you well that you want to replicate a pattern for, cover up any holes from design features or open toes, then fill the shoe with plaster of paris for crafting. 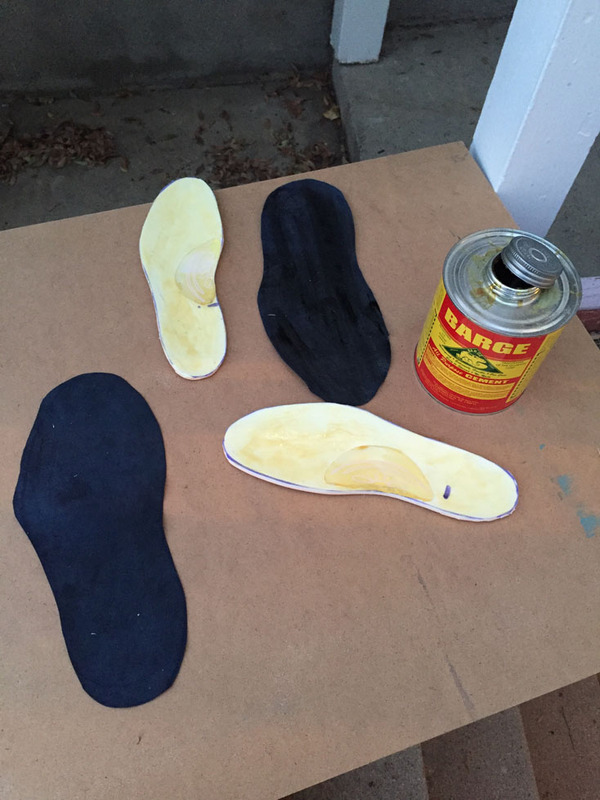 It dries quickly, and within half an hour you can cut around the shoe, save the pieces to make a pattern out of, then pull the plaster out of the shoe, which will be a perfect mold for your foot. 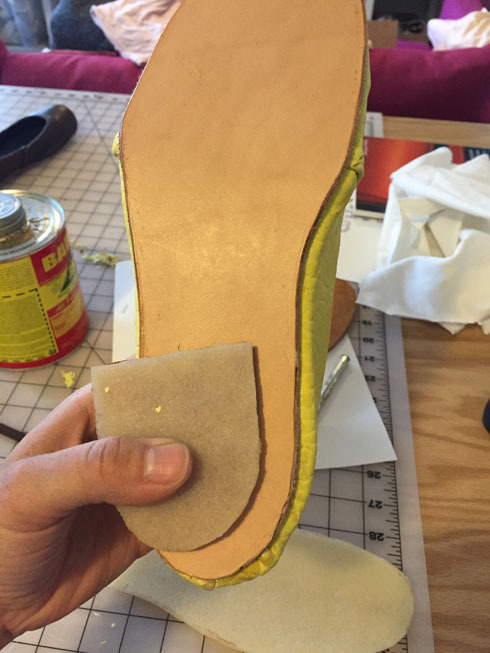 You have to make a new mold for each type of shoe that you want to make, but it’s cheap to do and it works really well. There is also a way to use shoeboxes filled with plaster of paris to make exact molds of your feet, but I haven’t done that before- the shoe mold worked wonderfully. I am sure you can find tutorials on this on the web if you use the right search words! Good luck! Can you share what and where you got the heat activated material you used for the toe box. Can you explain how difficult/easy it is to use and your experience in using it in your shoes. Your tutorial was a big help. Thank you for taking the time to share it. shoedo.com, as mentioned in the blog post 🙂 thanks for reading! Oh my goodness, your comment made my day! Thanks so much for reading and for sharing such encouraging words with me! Yup I agree with everyone else – that was SO helpful, such good step by step and great pictures! 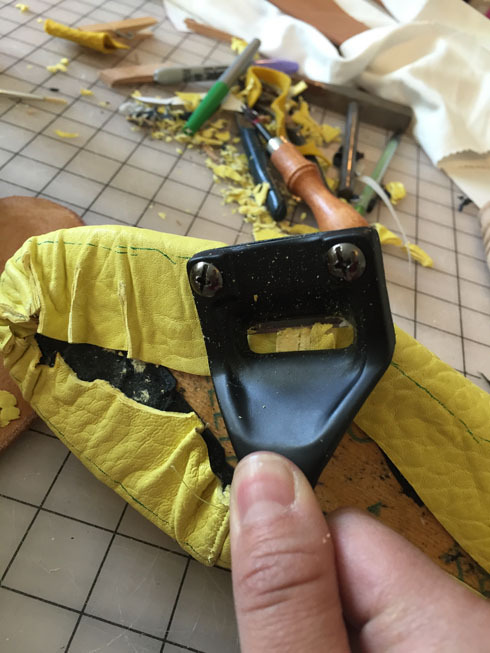 I learned from Sharon of simpleshoemaking and learned the handsewing method FIRST but now want to learn this method, and your post was by far the most helpful I’ve found!! Thanks for taking the time!!! And the links are great, love your clogs too, that you made 🙂 Blessings!! Tim Gunning It Ride, Sallie, Ride!